This entry was tagged camping, crickets, harmonica, instrument, music, noise. Bookmark the permalink. I just absolutely love this idea! 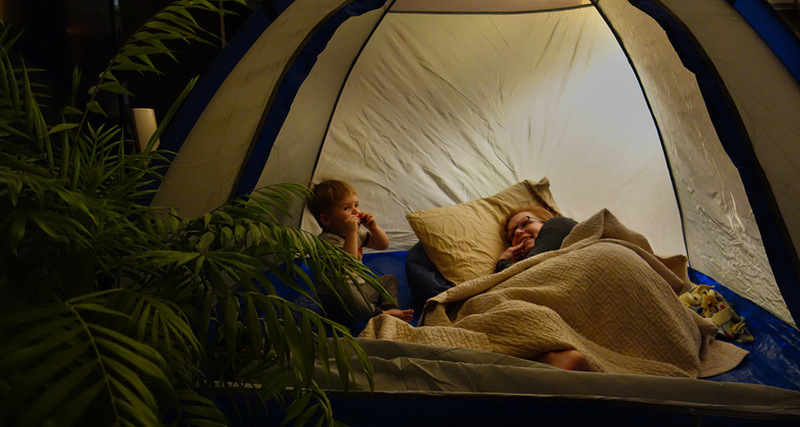 Camping indoors, looks like such fun! John Mark & I used to go camping until my knees gave out (years ago). It was fun, but on our last camping trip, the place was over run by skunks! Loved Henry’s harmonica playing, sounded like “Home on the Range” to me 🙂 And Jacqui looks so happy and cozy in the tent with her boy! This looks so fun and cuddly! Such a cute scene you guys created!